So here we go. 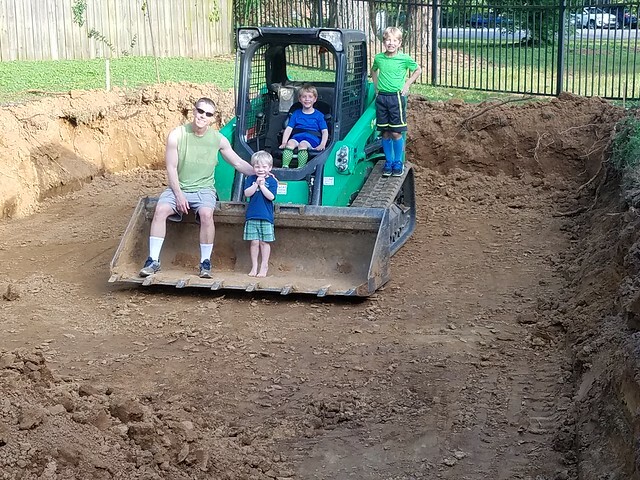 I found a local pool guy that works with his son and a couple other guys, and he was quite willing to let me DIY most of it, while helping me order things and basically make sure I don't mess anything up. The bigger guys wanted to do turn-key, and I am a DIY'er at heart. 16'x36' with 6" radius corners, vinyl over full width steps. The second "step" will be a 40" wide tanning/play ledge, perfect for my plastic adirondack chairs. 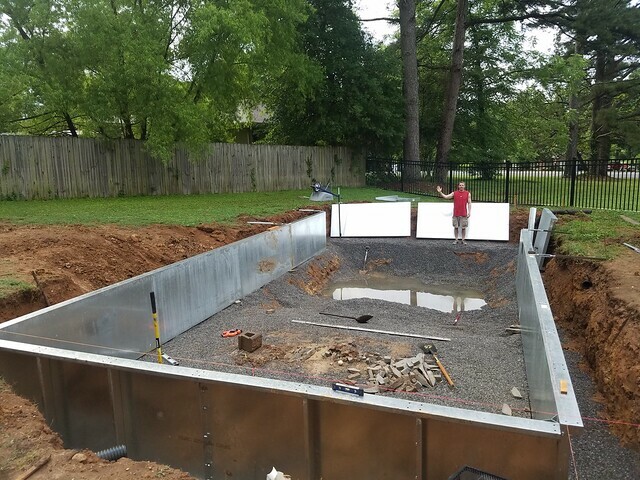 I am planning on a full-width bench on the deep end wall. The steel, liner track, and some assorted odds and ends will be a little under $5k. Liner will be another $2kish and I will have this guy and his son install the liner. They are also going to pour the decking. Ill do most of the rest, with likely some input and/or suggestions from him. The only thing I am struggling with is the depth. The pool my parents had when I was growing up had the water depth in deep end at 5'. I am 5'7" and standing on tiptoe I could walk around and breathe. We never had any issues jumping, playing, splashing, etc and we were all over the pool. The pool they have now the deep end is 6', nobody can stand, and aside from my kids and my sister's kids jumping in some, basically nobody uses the deep end at all. When we are over there, I would guess 95% of all activities are between the steps and about halfway down the slope. Same thing at a friend's house, they have 8' deep and diving board, usually 1-2 people will do a dive, and otherwise, there are 10 people hugging in the shallow end. I know this is one of those highly personal decisions...I am stuck on the 6' deep end being the norm, and the fact that even my best friend, 6'5" 300lbs will struggle to hang out down there. So...I think Im going with 5' water depth. We are also members of our community pool which has diving boards if we feel the need to do some olympic style diving. Planning to start the dig in about two weeks. 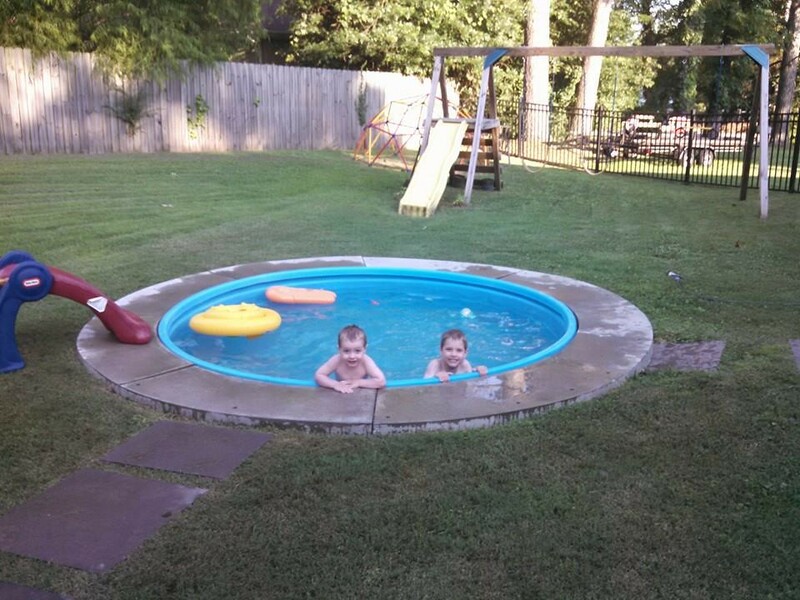 Mini-pool below, sad to see it go...been 5 great summers for my boys. The shallow end will be where the mini-pool is, the deep end will be at the swingset, and you can see the lake from that end of the pool, which is why I wanted a bench down there. Oh I am so in to watch this one. That all sounds well thought out. On the depth, 6' is not that common so I certainly wouldn't get hung up on it being standard. I think your logic is sound on why 5' is a good depth for you. I would recommend a second skimmer, plumbed separately back to the pad. Invariably, with a pool of much size, debris flow will not be perfect in directing it to a single skimmer. And, since wind affects surface water flow, it is often beneficial to have skimmers in opposing locations of the pool to account for differing wind directions after fronts blow through. Hopefully they are all WARM fronts though, since you are getting a great pool. good luck! keep us updated with photos of the build. Who is going to do the bottom work for you? THAT is where the skill really comes into play! I love your old mini pool. It’s very cute! Looking forward to watching your build. For what its worth, our PB said his two most commonly requested depths are 3.5 feet to 6.0 feet and 3.5 to 5.0 to 4.5. We are both short with no kids so we went with option B. Thank you for the link, your pool is beautiful. Are the 3 TREO lights enough? I have them in my Amazon cart and am planning on putting them on the long side facing away from the house and spaced at 9',18', and 27'...so basically dividing the pool up evenly with the lights. I wanted a fourth, but mainly because I like even numbers better than odd numbers, and can't really justify another couple hundred bucks because I dont like odd numbers! Any chance you have a dusk or nighttime shot with the lights on? That mini pool is awesome! 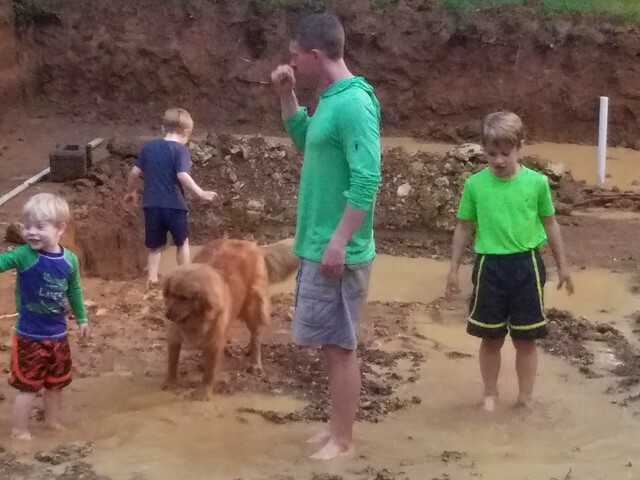 Yeah rain + pool dig/work = no work What will you do with the dirt? Are the boys having a blast playing on the hill??? Oh yes, they love the dirt hill! We have dirt everywhere, inside the house, outside the house, the driveway, our cars...literally dirt everywhere. Nice progress, and I remember dealing with the rain and subsequent muck during our build. Thanks! The guy that ordered the kit for me suggested that I dig out an extra 1-2" and get a gravel base (1/2" crushed limestone) down. He said it would help even things out for installing the walls, and would also help so that I can still work if/when it rains. That pic was this morning 6am, and I was able to get a little bit done because of the gravel base to walk on. The biggest hurdle was the dig, once I got past that and got the gravel base down, the stress eased significantly. That being said, I can't wait until I get the collar poured and can start backfilling. For the hopper...are there any benefits to pouring a concrete pad over just having it done in vermiculite like the rest of the floor? Hold on a bit while I put in a PM to someone who will know the answer better than I.